School is back in session, and it’s time for you to figure out the best back-to-school car for your Central Illinois student. Whether they’re in high school or starting their fall semester at U of I Champaign-Urbana or Illinois State University, students need a car that’s efficient, has room for their friends, and will get them to and from school reliably. We’re proud to say that three Honda vehicles earned spots on Kelley Blue Book’s 10 Best Back-to-School Cars of 2016,* and each one is available now at a Central Illinois Honda Dealer near you. That includes the winner of the top spot on their list: the 2016 Honda Fit. Price: The 2016 Honda HR-V LX 6MT is priced at just $19,215 (MSRP),** making it one of the most competitively priced crossovers. All-Wheel Drive: You can rest easy knowing each trim of the HR-V can be had with all-wheel drive to help make it through Midwest winters. Interior Space: The cabin of the HR-V has as much as 100.1 cubic feet of passenger space, but when you need to move that mini-fridge, the rear seats fold down and allow up to 58.8 cubic feet of cargo. Students have shipped off to college in Civics for generations, and the 2016 Honda Civic carries on in their tradition of affordability and practicality while featuring some of the latest technologies. Price: The 2016 Civic LX Sedan is priced at only $18,640 (MSRP) for 6MT models**** and includes advanced connectivity features as standard. Connectivity: Bluetooth for phone and audio is standard while Apple CarPlay and Android Auto are available to bring familiar apps to the dash. Spacious Cabin: The Civic is technically a small car, but it feels bigger on the inside with 97.8 cubic feet of passenger space—that could rival a dorm room! Safety: Advanced safety features like Lane Keeping Assist and Collision Mitigation Braking are found on the available Honda Sensing safety features package. Features: A multi-angle rearview camera and Bluetooth phone and audio are both standard while available upgrades like navigation and a Display Audio touchscreen take tech to higher levels. Interior Volume: Whether filling all five seats in the 95.7 cubic feet of passenger space or quickly folding the Honda Magic Seat into one of four configurations, the Fit’s interior makes it one of the most versatile hatchbacks around. 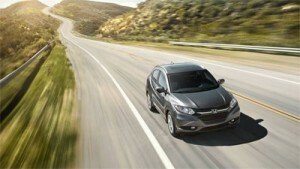 Bring your student to a Central Illinois Honda Dealer today to test drive a new Honda model. Don’t forget the peace of mind of a Honda warranty, which includes 36 months or 36,000 miles of basic coverage and 60 months or 60,000 miles of powertrain coverage. **MSRP excluding tax, license, registration, $900.00 destination charge, and options. Dealers set their own prices. ***Based on 2016 EPA mileage ratings. Use for comparison purposes only. Your mileage will vary depending on driving conditions, how you drive and maintain your vehicle, battery-pack age/condition, and other factors. ****MSRP excluding tax, license, registration, $835.00 destination charge, and options. Dealers set their own prices. *****Based on 2017 EPA mileage ratings. Use for comparison purposes only. Your mileage will vary depending on driving conditions, how you drive and maintain your vehicle, battery-pack age/condition, and other factors.